It's Christmas in July at CAS-ual Fridays Stamps! Today we are debuting the first of two holiday themed sets, this one is called Naughty or Nice. Another super simple, super graphic card for me. 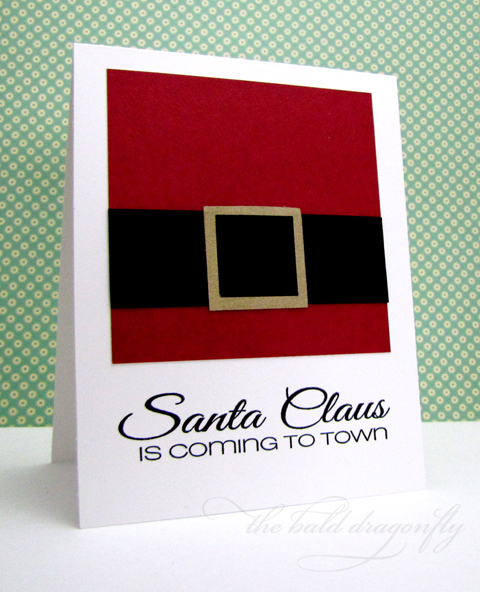 I simply stamped one of the awesome, large sentiments from the new set onto a white cardstock base and then made my Santa with a square of red cardstock banded with a strip of black cardstock and a buckle out of gold! 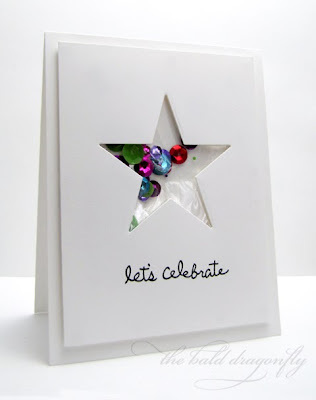 I hope you have a chance to stop by the CAS-ual Fridays Stamps Blog where you can see more amazing projects using this new stamp set, and I hear that there might even be a chance to win it too! 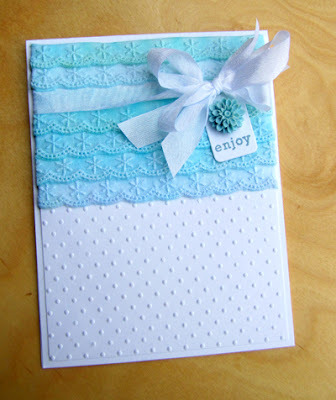 I have one last card showcasing the July Artful Delight Card Kit, as it is the last day of the month (how can that be? Summer is almost over already!) and the new kit will be revealed tomorrow. Making a card base from one of the luxurious solid card stock pieces from the kit and stamping a sentiment from my stash, I added a strip of patterned paper from the kit and then finished the card with a paper bow (the die is from Lil' Inkers Designs). Such an easy to reproduce card for a card set or I could even to change up the colors and make it my holiday design this year! 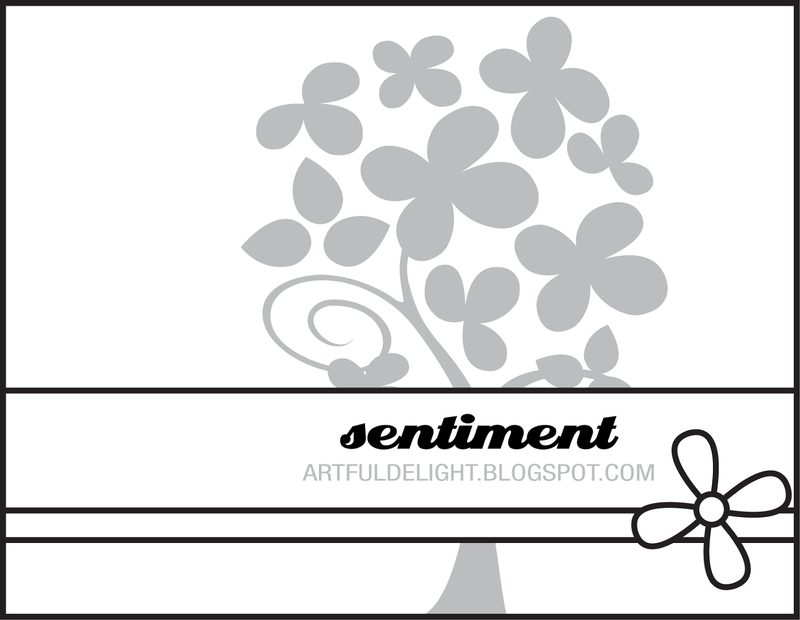 Check out the July Artful Delight Card Kit! My littlest one and I went on a "date" a few weekends ago. We ate lunch at a local restaurant and then went to see Monster's University. The instructor that shows up at the end of the movie is the same one from the original (you know, the octopus looking purple monster with the old-style glasses?) She inspired my card today for the CAS-ual Fridays Stamps release of this month's Fri-dies. This die is called Oval Tags and they are super fun to use and super versatile. 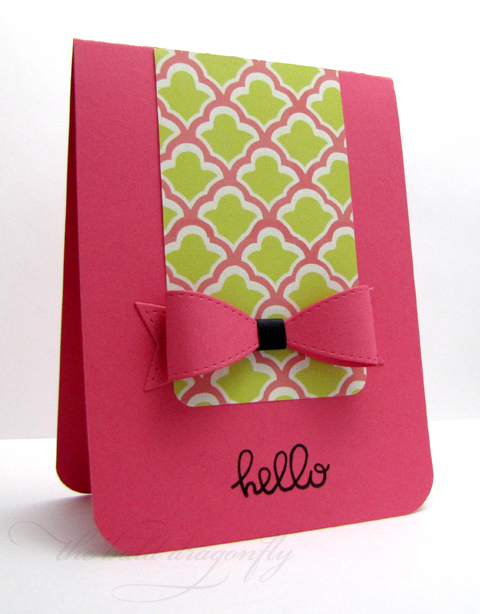 I die cut two of the three dies (the ovals without the tags) in aqua and bright pink cardstock. I attached them to a card base and then adhered white and black circles for the eyes. The nose part of the glasses was trimmed from another oval. 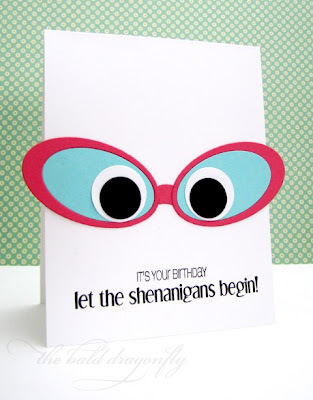 I added sentiments from WTF and Shenanigans to finish off the card. Something different from me, something fun...in my opinion! 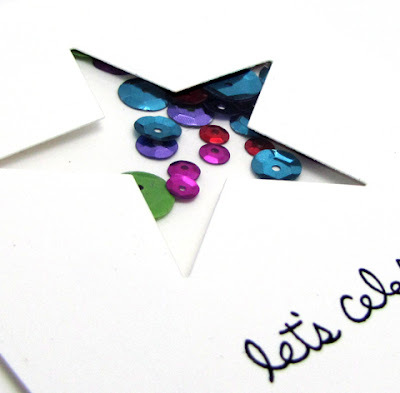 I hope you have a chance to stop by the CAS-ual Fridays Stamps Blog where you can see more amazing projects using this new Fri-die, and I hear that there might even be a chance to win a set too! I have the pleasure of being a part of the CAS-ual Fridays Stamps design team and there is another introduction of a Fri-dies called Bubble Dies! These are super fun. 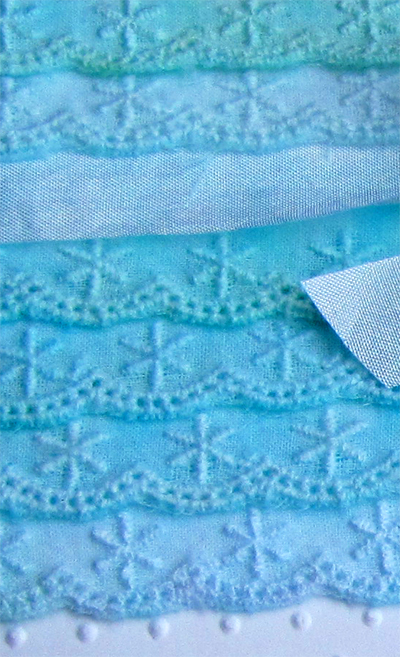 I die cut the larger of the two bubble dies out of double sided patterned paper, scored on each end where the smallest "circle" met the middle circle, punched a hole through both folded layers and then threaded it onto a card base with some May Arts Burlap String. I stamped a customized sentiment from Only You onto a punched circle and adhered over the middle circle completes the look. There are so many great things happening at CAS-ual Fridays Stamps-have you checked it out? New design team members and new matching dies, call Fri-dies! Love! Today we are introducing a Fri-die called Loving Bloom, which so happens to coordinate with CAS-ual Fridays Stamps Loving Thoughts set. 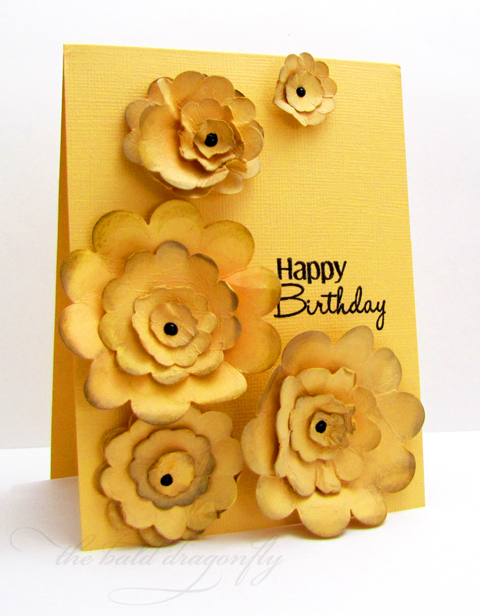 I started my card by die cutting many flowers in all four sizes of dies included in the die set. I then stamped them with the flowers from Loving Thoughts, poked them through a pin, misted them with water and wrinkled and warped them. 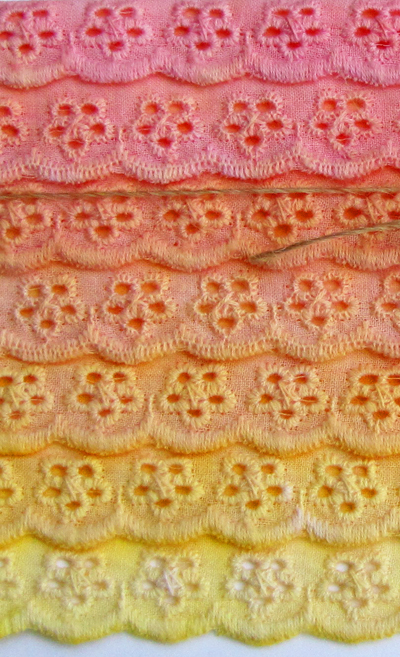 After drying overnight, I glued the layers together and finished each bloom off with a black enamal accent. 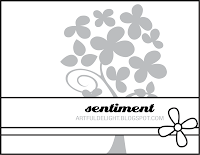 These flowers where then attached to a matching cardstock base that had been stamped with a sentiment, from Casual Elegance. My maternal grandmother divided some of her beloved peonies for me this year. I remember looking at the big bush with the beautiful blooms year after year as a child, and hopefully next year will be able to look at them again in my own yard. The flowers from the Lawn Fawn stamp set included in the July Artful Delight Card Kit reminded me of peonies, so I paper pieced them with a few of the lovely patterned paper from the kit. 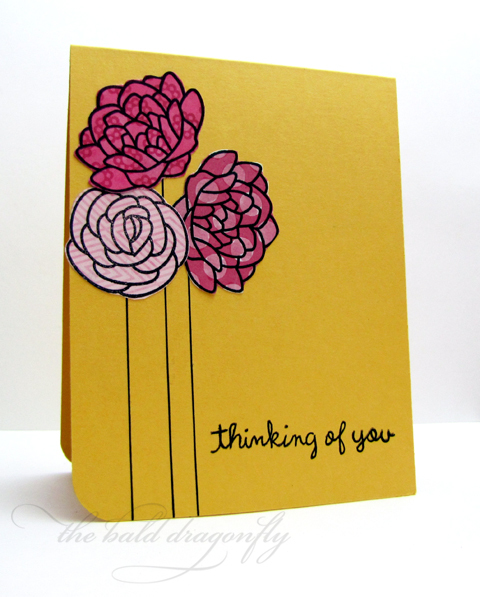 I drew some simple lines for stems right on to the thick cardstock (also from the kit) and stamped a sentiment. Simple and sweet! May Arts Ribbon is showcasing their 2012-2013 Design Team before the new one is announced and they are having a little party! 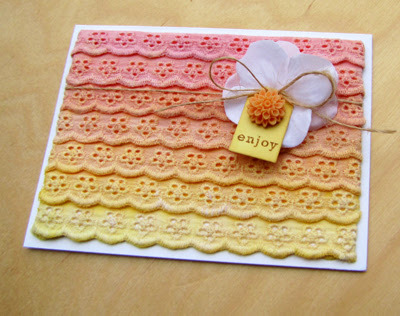 All week you can comment on the Ribbonista's Blogs and the May Arts Blog for your chance to win some free ribbon! Each and every year, I count my lucky stars to be able to work with May Arts Ribbon and represent them. Fantastic products, fantastic customer service, fantastic team! Ribbon Bow Wreath: Topping the list of my all time favorite projects of this last year is this wreath. 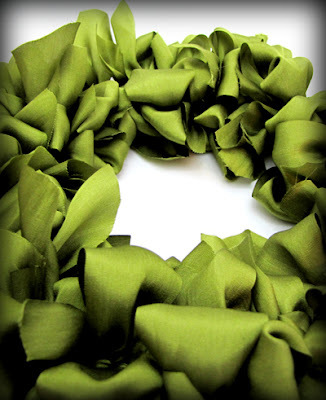 Silk Ribbon is my all time favorite product from May Arts, and this wreath is full of it! 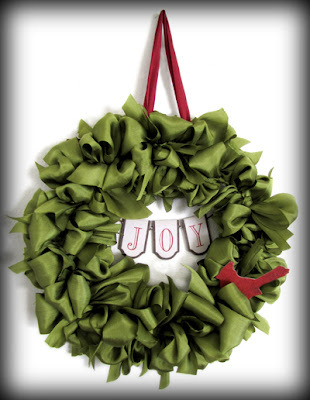 I love the depth and life-like look of the satin ribbon tied in bows and scrunched together to form a wreath. Acorn: I love decorating for the holidays, but also for seasons. 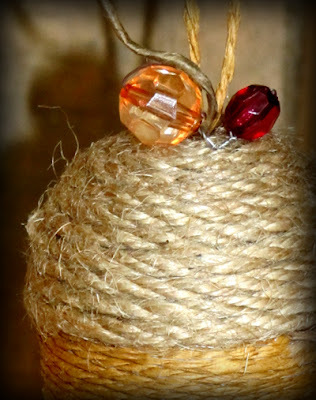 This simple acorn ornament showcases the product other than ribbon offered at May Arts: jute and paper cord. 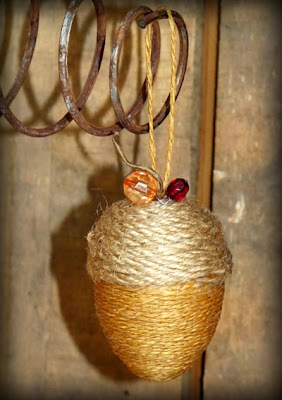 I love the simplicity of this acorn and how well it represents fall. 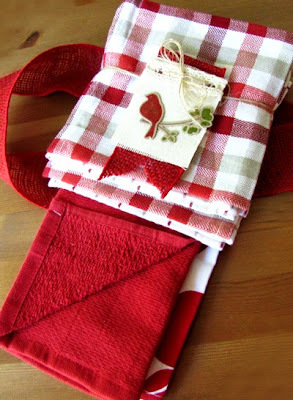 Towel: I love how May Arts products can vamp up an ordinary object into something extraordinary and perfect for gift giving. 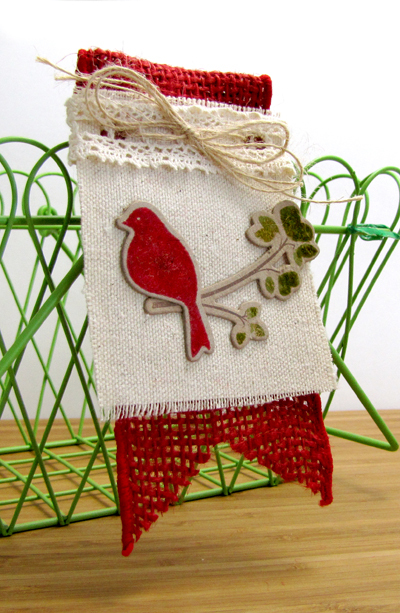 This tag compliments the towel and gives the gift extra texture, color and pizazz. Here's the schedule for the participating Ribbonistas, and don't forget to stop by the May Arts Blog too! Large handwritten sentiments, funky and graphic circles...Sign me up please! I have the pleasure to release another set for the July Release at The Craft's Meow! This set happens to be the July FREE GIFT w/$50 purchase!! There are many versatile sentiments and two large circles included in this small set, so it gives you many stamping options. 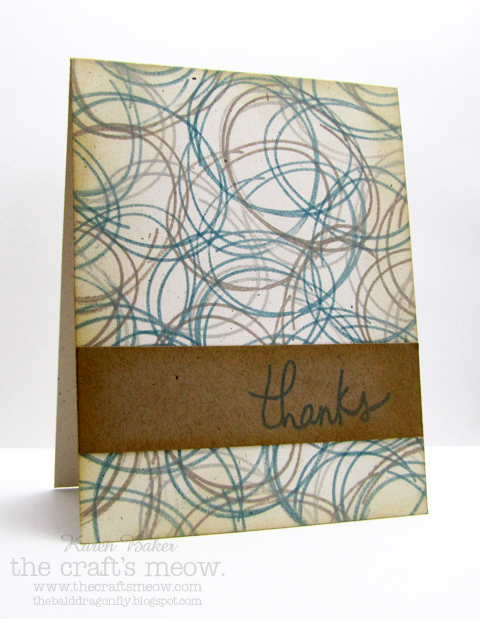 I decided to channel my inner graphic designer and use one of the circle stamps and create a free formed, funky background right on the card base. I used four different inks (two shades of tan and two shades of teal.) I inked the edges and then finished with a stamped sentiment panel. How about stopping by The Craft's Meow to see the other amazing creations using Circle It?! You've got a chance to win these this much needed set for free! 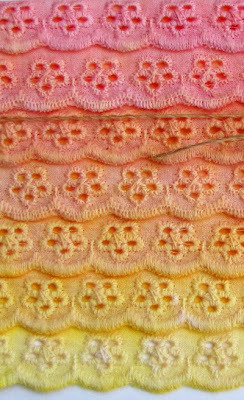 ***Please scroll down to see the debut of my stamp set "Welcome to the Office"
I started by cutting a 7-8 6" lengths of the trim and then soaking it in the yellow H2O, and then worked in some of the orange and red. I layered the trim to a piece of cardstock using double stick adhesive, tucking the edges in. 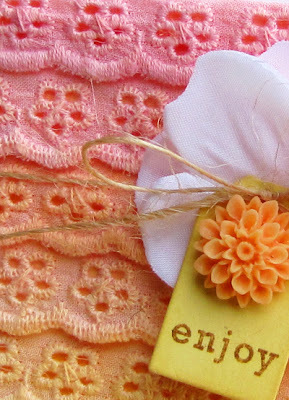 I finished the card with some natural burlap string (SM10), a satin flower from May Arts (439-01) and a tag and homemade clay flower embellishment. I think the look is so sweet. The trim used on this card was the more solid of the series. I oriented the card vertically and attached the ribbon over an embossed cardstock panel. 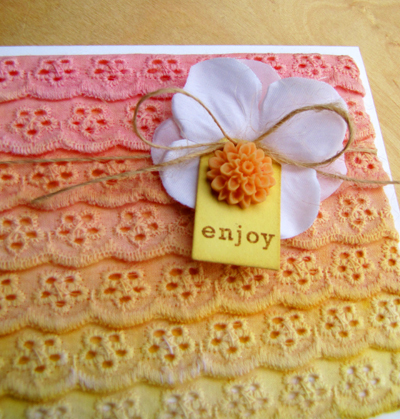 This card too, was finished with with a tag and handmade clay flower embellishment, but I added some white wrinkle ribbon (EA01) and bow for extra impact. I hope these projects inspire you to customize your own ribbon! 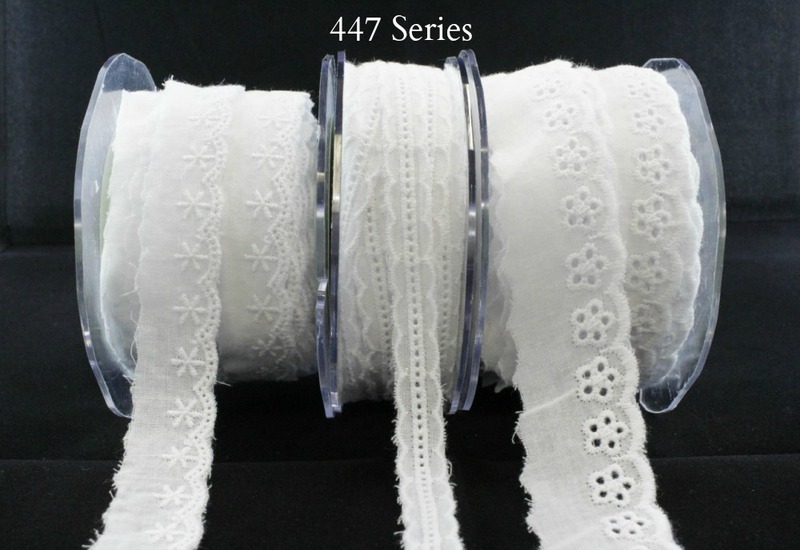 It gets even better, there are prizes up for grabs from both May Arts Ribbon and Splash of Color: a 6 pack of petite Luminarte H2Os and all three spools from the May Arts eyelet series! So a lot of stampers are working individuals, we go to an office every day, five days a week, and then as a hobby we stamp! I decided to showcase our "double lives" by creating an office themed set for the July Release at The Craft's Meow! I hope you will love all the images, and especially the sentiments that are created especially for your friends at work (but are also versatile enough to be used on other projects too!). 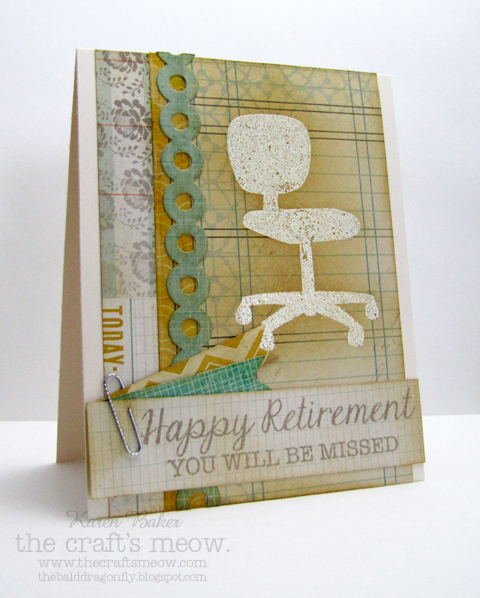 I started this card by embossing the chair image from the set in cream powder onto patterned paper, and then inked around the chair for additional highlights. 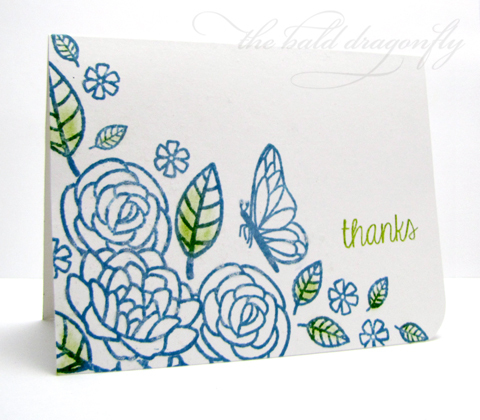 I added some patterned paper border strips and then stamped the sentiment onto coordnating paper. A few banners and a paper clip finished off the theme of the card. I'd love for you to catch a look-see at the other amazing creations using Welcome to the Office at The Craft's Meow. Please be sure to stop by for a visit at the Blog and the Designer's Blogs. 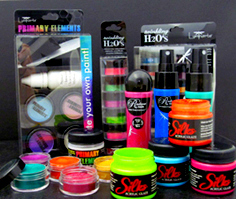 You've got a chance to win these this much needed set for free! This card started with a simple soft yellow cardstock that was wrapped with light green May Arts silk ribbon (SK08) and tied in a double bow with the cream ribbon (SK09). 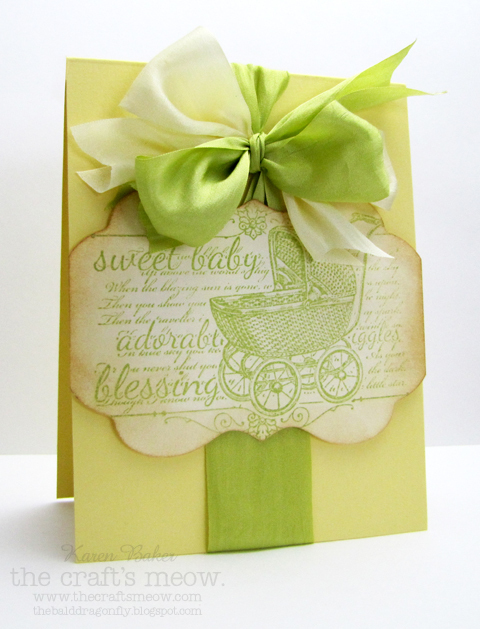 I then stamped the large image from Vintage Baby with soft green ink onto cream cardstock and inked the edges. 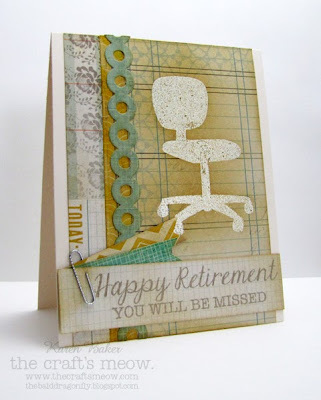 I die cut this into a soft shape and adhered it to the card with dimensional adhesive. Once again, you can catch all the amazing samples of Vintage Baby at The Craft's Meow. Please be sure to stop by for a visit at the Blog and the Designer's Blogs. You've got a chance to win these this beauty of a set for free! Ooh, I'm so far behind, I was supposed to schedule two posts for today and I totally missed it! Yikes! Well, I'm here now to show you lots of stuff, please excuse the longish post! 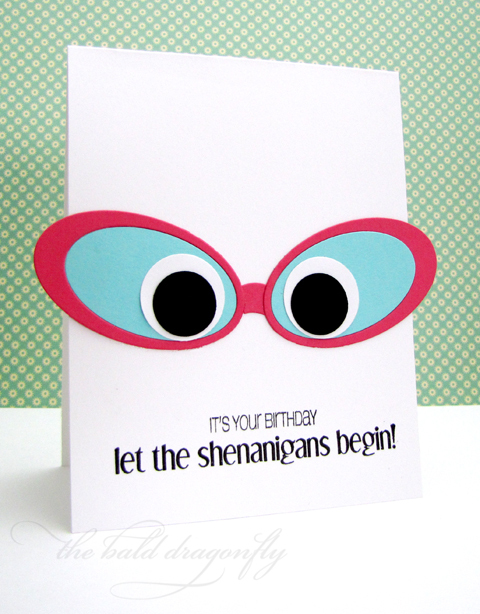 So this first card is made using the adorable set, Turtle Love, from the July Release at The Craft's Meow! Mindy Baxter joined The Craft's Meow as an illustrator and she has just thee most cutest designs. 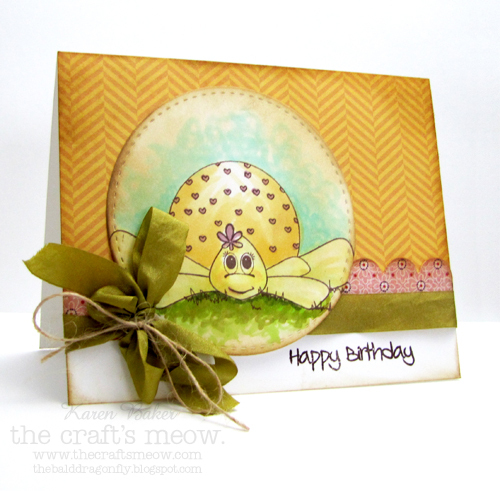 For the turtle card, I stamped and colored the main focal image and die cut him out in a circle (from Lil' Inkers Designs.) I mounted the circle on top of some patterned paper, added a scallop strip and then stamped the sentiment onto the card base. Then I added some amazing crinkle green ribbon (EA06) and burlap string (SM10) from May Arts to finish the card off. This next card features the second set debuting from Mindy called Hogs & Kisses. I capitalized on the cute little piggy stamp and made my own background paper. 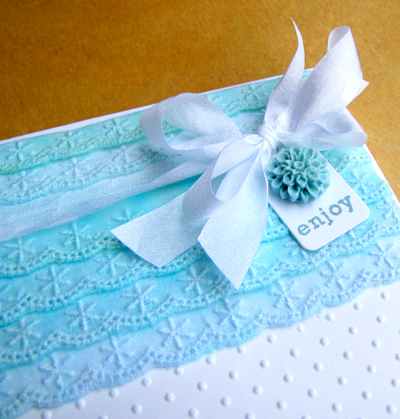 I added some patterned paper banners and stamped a greeting from Many Thanks. You can catch all the amazing samples at The Craft's Meow. 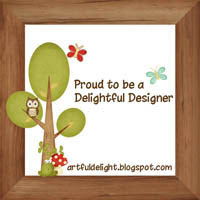 Please be sure to stop by for a visit at the Blog and the Designer's Blogs. You've got a chance to win these two sets for free! 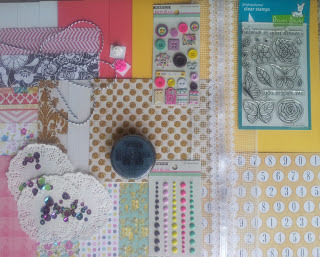 Switching gears, I have a card for Artful Delight to show you as well made from contents of their July Artful Delight Card Kit. 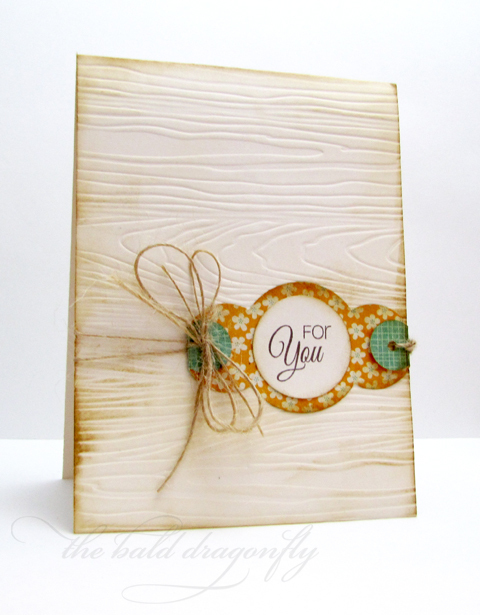 This kit was so diverse, there are products for every kind of card maker in the kit! So I created a shaker card using only a small portion of the sequins. I die cut a star out of a panel from the white cardstock in the kit, added sequins to a clear bag and attached the bag to the underside of the panel. I stamped a sentiment and then the panel was adhered to a white card base. I had a few cards make there debut on the CAS-ual Fridays Stamps Blog today. The first one features Lotsa Links: I created the background by stamping at an angle one of the cool smaller border stamps in pink and then came back with one of the larger stamps in a vintage hue. The edges were inked and then I stamped the sentiment from Wonderful Words and added a handmade cochobon and some May Arts Burlap String. 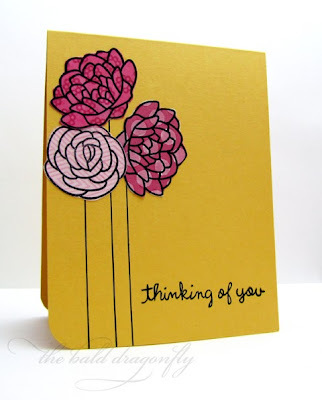 This second card started out with a handmade background using Twinkling H2Os and then I finished with the same stamped sentiment and flower from Wonderful Words, available at CAS-ual Fridays Stamps. 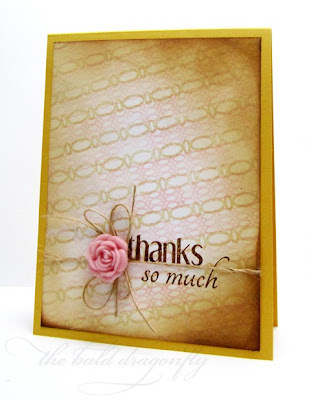 I really like how Michele's stamps make a big impact when stamped in such contrast to a soft background. I was driving to my destination the other day, stopped at a red light, when I happened to look at the car next to me. Driving was a handsome gentleman and his front seat passenger was a huge, beautiful bouquet of roses. Not red roses, but a mix of pink, lavendar and yellow roses. It was huge, seriously! The light turned to green and we both drove on, but I kept thinking how he was gonna make some woman very happy. I made a one-layer card using the goodies from the July Artful Delight Card Kit. The kit came with a really fun Lawn Fawn Stamp Set, so I started with a white cardstock base (also from the kit) and stamped the large flower image in one corner with the ink pad from the kit and moved out, filling in areas with the smaller stamps. Once I was finished, I stamped a sentiment (from another Lawn Fawn set, not included in the kit) in a contrasting color and then came back and touched up some of the leaves with colored chalk. Finally, I spritzed the entire card with a shimmer, but unfortunately that doesn't show in the photo. Did you know that Artful Delight also offers a monthly sketch challenge too? It is where you create a project using either the card or scrapbook sketch for a chance to win a kit!